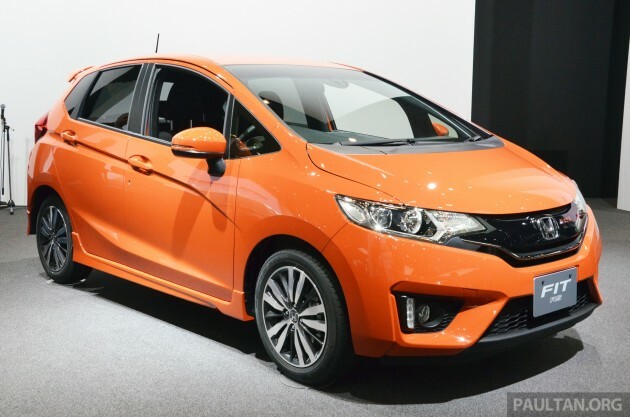 Sitting at the top of the third-gen Honda Fit (Jazz) range in Japan is the Fit RS – this one’s FWD only, and is solely powered by a 1.5 litre i-VTEC four-cylinder engine that produces 132 PS at 6,600 rpm and 155 Nm of torque at 4,600 rpm. It’s the only Jazz on display at Honda’s 2013 Tokyo Motor Show stand. It’s also the only Jazz variant in Japan that can be specified with a six-speed manual, although a CVT is also available. Exterior features include a gloss black grille ‘wing’ with the RS badge, vertical LED DRLs beside the fog lamps, side skirts, a prominent and more sculpted tailgate spoiler and 16-inch alloys wrapped in 185/55 series tyres. That body colour is exclusive to the RS, too. Inside, you’ll find fabric seats with red stitching and a unique red pattern, classy-looking gloss black trim on the dash and door cards, plus aluminium foot pedals. JC08 fuel economy is rated at 21.4 km per litre (CVT) and 19 km per litre (manual). I actually quite like the way this one looks – what say you? Body line is like got crash over by Sam Loo Hilux! This car should be called Honda Fatt not Honda Fitt. Because it smells like fart. Only K5 owners buy this trash for their wives. Low RV and no trade in value. Habis lah Sam Loo. Now he cannot sleep. From City to Jazz, all come with safety features like VSC. Everybody knows Toyota got no VSC in their Vios. Most likely he will come here and talk bad about this car but we all know he is running scared these days. Vios owner don’t care bout VSC wan la…they only care bout RV..even though Vios is as rubbish as Sam Loo Hilux face. I really pity the K5 owner. Got shown the Hilux and the broomstick. ya…ya…when you steer 30degree on the wheel, your toyoita Vios will turn turtle and roll into Klang River. Volkswagen Golf better than this. Really a genius, compare Fit with golf..
sohai since when Jazz or City got type R? dun just add some spoiler n call urself type R.
You la sohai.. Go search the news about Jazz type R .Unlike vios with spoiler n grey skirting, then called TRD.. Nice!!! waiting for come here!! Is it just me or I’m the odd one out to think that touch sensitive controls are a bad bad mistake on a car. Maybe call me old fashioned, but I still very much prefer the very tactile feel of regular buttons and knobs. Very much like I prefer a proper keypad on a mobile phone instead of a touch screen. I do understand that knobs and buttons are more expensive to do up properly than touch interfaces. I too dislike the touchsensitive thing but it has kick off a certain trend lately. All started with Tesla and its Titanic screen, now you have Citroen and Peugeout having a smaller but the same intergrated touch system and touch sensitive system in almost all new Hondas and Lexuses. Until I get some thumbs up from Lexus IS driver or new Odyssey drivers, I’ll have some doubt in this system. Not bad, but where is Type R? 6 Speed Manual! Bring it in!!!!! 10x better looking than Swift Sport. Might handle just as well? No? Would encourage you to buy a new Elantra. Mind you that you will be looked down by your colleagues, your bosses will deem you not trustworthy, your relatives will give you the funny look as if they just saw a tai lan ngong and most of all, you will have ultra low self- esteem driving a kimchi. But within 6 months, you will have the urge to get rid of it, I will take it from you for 45% of selling price provided its accident free. I crash this car into the bridge, I dont care! I love it! macam honda city yg baru (2014) tapi version hatchback. haha. So very beautiful and great Honda Jezz,I very love Honda Jezz.